At present, it would be hard to imagine life without the presence of hair salons. Whether people need to prepare for a wedding or simply to change their hairstyle, the truth is that they are simply there take care of their hair. While the client gets pleasure from the salon experience, not the same can be said about salon managers. It is their duty to make sure that they enjoy a perfect beauty session and the fact is that in order to satisfy clients’ needs and to keep the business running there are a lot of decisions that they are required to take and to tend to the smallest details. The way in which the manager handles certain issues can seem like a miracle and there are a few tips to successfully administering the business and keep clients coming back. The fact that salons are open all days of the week is no surprise to anyone. This is the reason for which keeping track of clients and appointments can be overwhelming at times. The truth is that you are left very little time for yourself and in that period you have to function at full capacity. Organization is important due to the fact that with this myriad of customers it is very easy to forget about appointments or to be unprepared and as a result to not be able to fully concentrate on the tasks that you are required to tend to. No one desires to step into a chaotic salon and this is the reason for which the employees together with the manager must display attention for detail and also delegate responsibilities. The difficulty lies in the fact that the products can be stored in more than one location and it is not easy to oversee how much of a product is being used for particular services. However, this is a necessity rather than a luxury. It is vital to see what quantities of products are being used due to the fact that monitoring can save wastage and consequently business losses. Only by implementing an inventory system can the manager fully grasp what are the levels of wastage during the course of a month and also to be aware at all times when new supplies need to be made. It is an undesirable scenario to run out of products during a beauty session. This is why it is important to monitor inventory levels and keep a register with the products that are taken from the storage room. The essential thing is that the salon should be inviting to the client and knowing what each person prefers can add to the general image. Besides quality services, the salon should be thoroughly organized and you should have efficient employees. Catering to the needs of the existing clientele is not enough and in order to make the business thrive it is recommendable to advertise and try to bring in new clients. This is done by arranging the shelves beautifully, but also by offering retail products. You should also train the personnel to be more polite and in addition to this keep in touch with the help of social media. All the issues presented above are just a few of the things that a salon manger has to deal with on a daily basis. Luckily for them there special apps such as that from MyCuts that have been designed to help them keep organized at all times. But nothing can replace old-fashioned organization. An alarming number of missed appointments and double bookings is a problem all salons encounter. The earnings of a salon are limited by the number of filled chairs, so the importance of a reliable appointment booking system is undeniable. The fact that clients often forget about their appointments and do not show up is already a major problem, but the scheduling mistakes hairstylists make when trying to manage their clients can ruin the salon altogether. Although appointment booking is not rocket science, things are not as simple as writing a name in a calendar either. The client scheduling needs and the availability of the beauty professional often clash, so a system that can handle these complexities can greatly improve the salon operations and the client experience. After missing an appointment, clients often call to arrange another date, this time on short notice. Having to reschedule everything and make sure that the new appointment will not get delayed puts a strain on the hairstylist. Refusing a loyal customer point blank is out of the question, so squeezing the appointment somewhere in the already busy schedule is the only solution. The problem is that your client also needs to have a free schedule when you do. This to and fro is normal, yet damaging when trying to match schedules especially on short notice. You can avoid scheduling mistakes by using a salon app. The idea of double booking can be completely dismissed when using this type of system, while rearranging appointments is no longer necessary, because automatic appointment reminders are send to your customers. If they are reminded that they need to make a visit to the salon a day prior, there is no reason for them to miss the appointment anymore. The app will not eliminate all your client management problems, but it will definitely make your job easier. 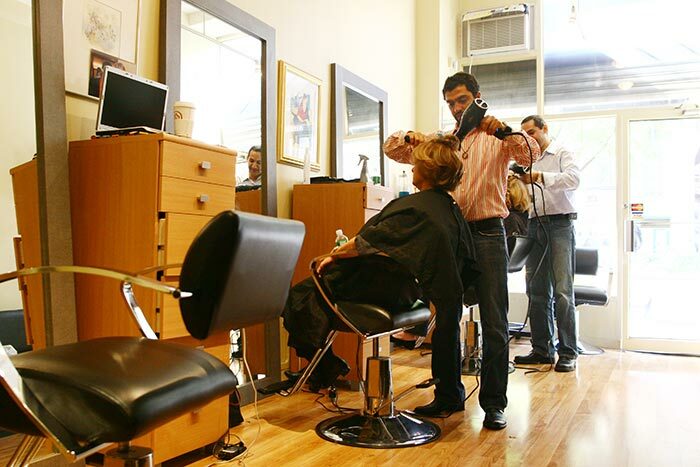 Salon etiquette requires a strict compliance with the established appointment time. The unnecessary waste of customers and hairstylists’ time caused by missed appointments and double bookings can ruin the relationship between client and business permanently. It is in the best interest of the salon to find a solution to this problem and try to avoid scheduling errors as much as possible. Numerous factors can make appointment scheduling rather challenging and these impeding problems can be quickly solved with an integrated scheduling system. People go to a salon to get pampered and expect to be the center of attention while they are sitting on that chair. If a stylist is overbooked and running late, their image as professionals will get ruined. It is essential to be respectful of the time of your clients to ensure that they will come back. An amiable atmosphere is essential inside a salon and being late is something that can cause strife. Salon apps lie at the intersection of providing efficiency and timely access to services, because these systems ensure not only that clients are constantly reminded of their appointments, but also that stylists will manage their schedule better.